This is the second article of three consecutive monthly articles in Machine Design [November 2016, December 2016, January 2017] discussing the strategies and tactics that companies should take to position themselves to compete effectively as the Internet of Things evolves to become the end game for products and services in the years ahead. This article makes the point that capabilities for the Industrial Internet [IIoT] and the Internet of Things [IoT] should begin at the earliest stages of product architecture and the commissioning of the product into the development pipeline. Certainly, many existing products will need to be retrofitted for IIoT and IoT capabilities. But, the time to start initiatives for new product "IIoT/IoT-Readiness" is now. 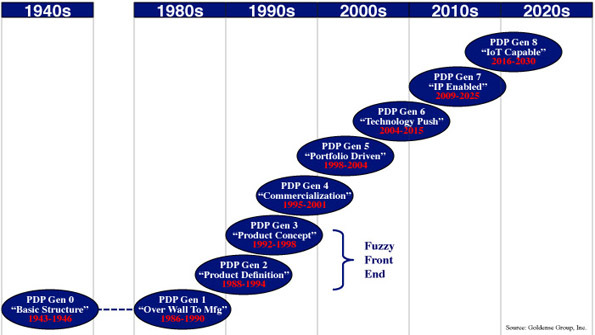 Design Thinking for IoT in the Product Development Process [Machine Design - December 2016] addresses the "8th Generation" of product development processes that will systematically enable "IoT-Readiness" and "IoT-Capabilities" in new and future products and product lines.